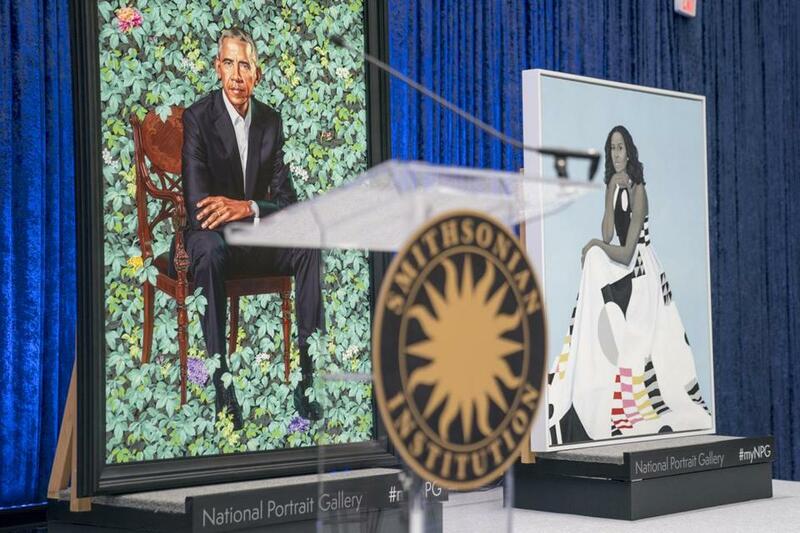 From left: Artist Kehinde Wiley, Barack Obama, Michelle Obama, and artist Amy Sherald. 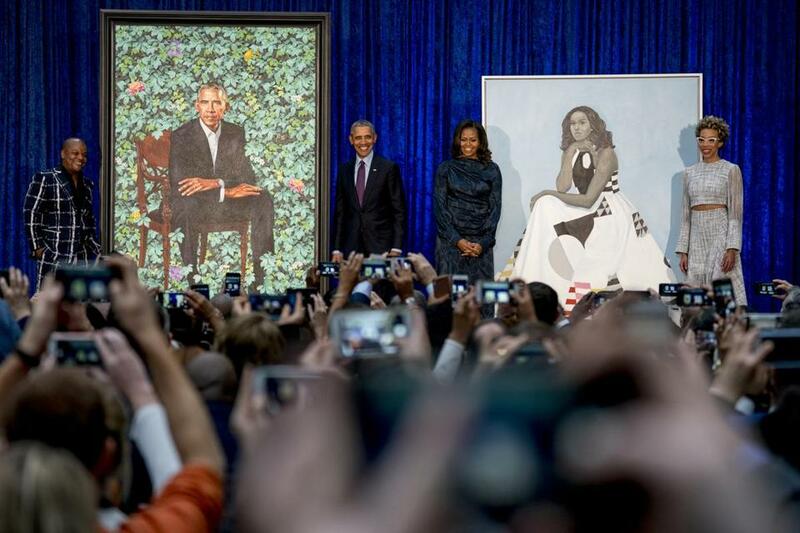 The National Portrait Gallery revealed paintings of former president Barack Obama and first lady Michelle Obama on Monday, leading to some head-scratching among viewers. 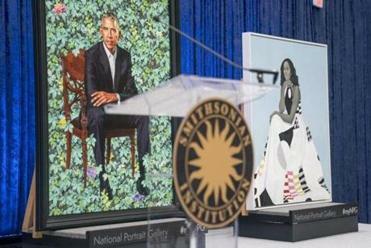 The Obamas personally selected their artists, both African-Americans: The former president chose Kehinde Wiley, while the former first lady tapped Amy Sherald. The museum has a collection of presidential portraits — one that generally evokes an image of artworks painted in a more traditional manner. So when the image of Obama, posing amid a background of bright green leaves and flora, many took to Twitter to register their surprised reaction — including a few pokes at former presidents and references to popular memes and gifs. But there’s more to the portraits than initially meets the eye, according to art critics. Here’s a deeper look at the new artworks. The former First Couple’s unveiled portraits are testaments to their grace and elegance. Initially, the most striking part of the former president’s portrait is the background — a collection of greenery with a few different-colored items of flora interspersed throughout. Artist Kehinde Wiley (left) and former president Barack Obama at the unveiling. There’s a reason for that: The background is a nod to historical portraiture, according to The Washington Post’s Philip Kennicott. 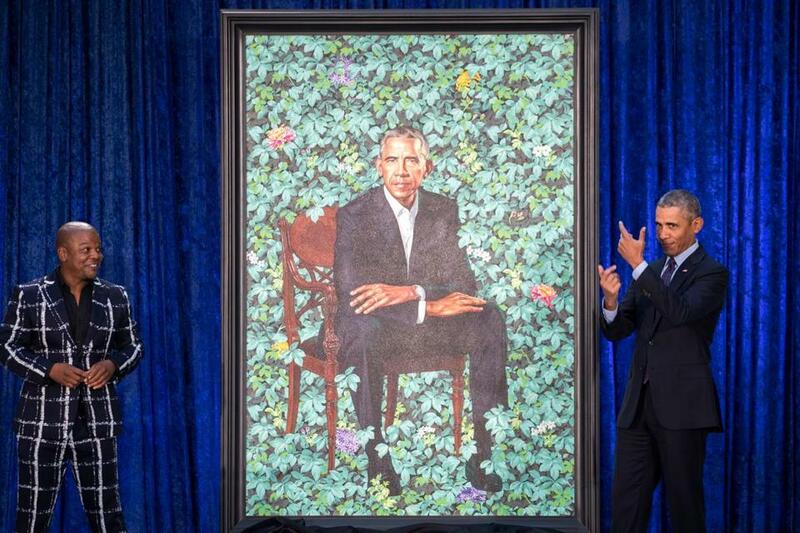 Meanwhile, the different flowers symbolize Obama’s personal background: There are African blue lilies, a nod to his father’s birthplace of Kenya; jasmine, which represents Obama’s birthplace of Hawaii; and Chicago’s official flower, chrysanthemums. Obama’s pose itself also has echoes of Robert Anderson’s official 2008 portrait of George W. Bush, Kennicott wrote. And The New York Times’s Holland Cotter notes that the chair Obama is seated on comes off as “thronelike” — perhaps a nod to his eight years of being leader of the free world. (Cotter notes that the chair is not unlike the one seen in Gilbert Stuart’s portrait of George Washington. Meanwhile, the former first lady’s portrait shows her in a black and white dress looking thoughtful with her hand on her chin. 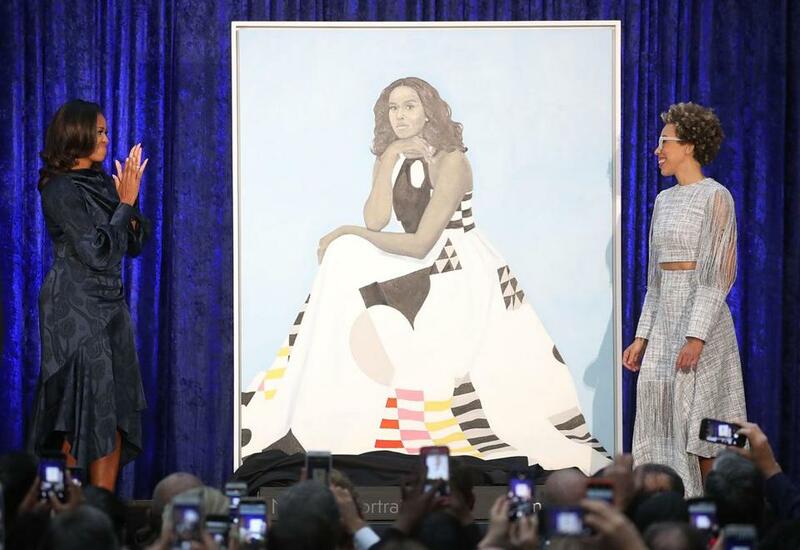 Michelle Obama (left) with artist Amy Sherald. Meanwhile, both portraits are life-sized — the former president’s is about seven feet tall, according to the Times — underscoring the subjects’ “historical importance and accomplishments,” wrote Kennicott. 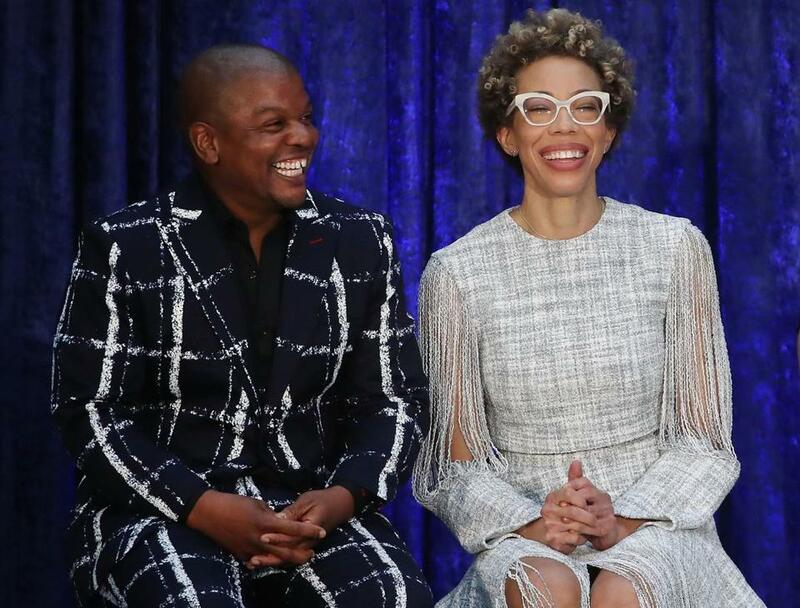 Artists Kehinde Wiley (left) and Amy Sherald. Kehinde Wiley, the artist chosen by Barack Obama, is best known for his vibrant, large-scale paintings of African-Americans. His paintings are often rooted in hip-hop culture, according to Kennicott; has painted famous black musicians like LL Cool J, Michael Jackson, and Notorious B.I.G. ; and is known for portraying his subjects in Napoleon-esque poses. The former president also said he and Wiley had many similarities: They both had African fathers who were largely absent from their lives and American mothers who raised them. Meanwhile, Baltimore-based Amy Sherald is fairly new to the art scene: Until a few years ago, she made a living as a waitress, according to Cotter. She was the first-prize winner of the Portrait Gallery’s 2016 Outwin Boochever Portrait Competition, and, according to the Times, now oversees a studio staff of one: Herself. Sherald also is just moving into the national spotlight after dealing with a family health crisis, as well as her own health: She had a heart transplant at 39, according to the Times. After the initial unveiling, critics had quite a bit to unpack — but the consensus seems to be that the portraits’ striking visuals are a needed addition to the museum’s collection. Although both of the artists toned down aspects of their usual styles to inject more dignity into the pieces, both “stressed the importance of creating portraiture of African Americans that will reconfigure the canon and the museum in more inclusive ways,” Kennicott wrote. “No smiles, no Mr. Nice Guy. He’s still troubleshooting, still in the game,” Cotter wrote. Both critics noted that the dress forms a pyramid-esque visual, but each had their own opinions. What do the Obamas think? Former president Barack Obama and former first lady Michelle Obama at the unveiling. 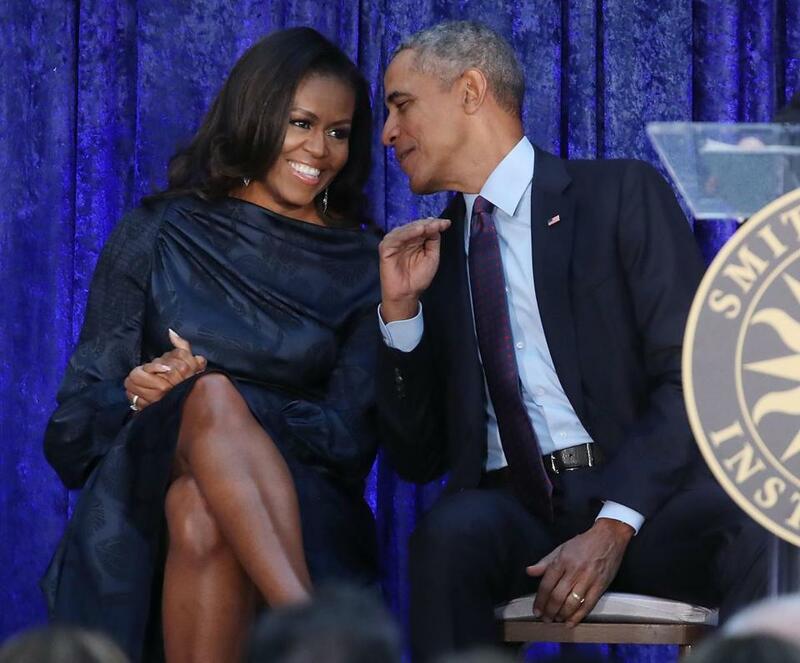 They may not be art critics, but the Obamas spoke at the unveiling about their experiences sitting for the portraits — and also what they thought about the final result. The former president said he felt “impatient” while sitting for his portrait, saying that he would get bored and constantly look at his watch. Obama said Wiley listened carefully to his suggestions — and then ignored most of them. The former president also said he asked for less gray hair and smaller ears, but was promptly denied. Obama also joked that he knew Wiley was wont to portray his subjects in a regal manner, and that the former president told the artist no scepters or horse-mounted scenes. “I had to explain that I’ve got enough political problems without you making me look like Napoleon,” he joked at the unveiling. Where will this artwork go? No, these portraits will not be in the White House — a second and different set of portraits of the former first couple will eventually hang there. However, according to Cotter, Barack Obama’s will be displayed permanently in the National Portrait Gallery’s presidential collection, while his wife’s portrait will hang in a spot dedicated to temporary displays — something he argued against in the #MeToo movement’s era. “If first men have an acknowledged showcase, first women — ladies or not — should too,” he wrote. Wire material from the Associated Press and Washington Post was used in this report.